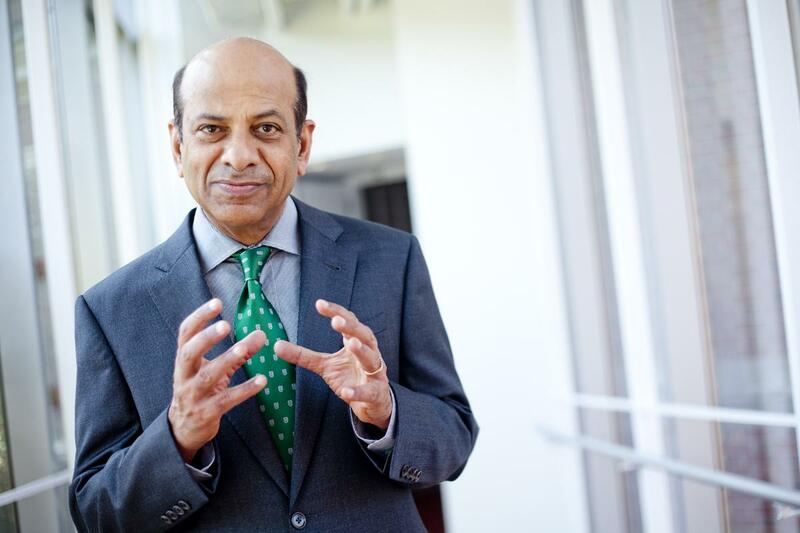 Everybody at Tuck knows Professor Vijay Govindarajan—a.k.a. VG. At Tuck since 1985, and a consultant to companies including GE, Tata, IBM, Hasbro, and more, VG has taught thousands of students and executives about strategy and innovation. 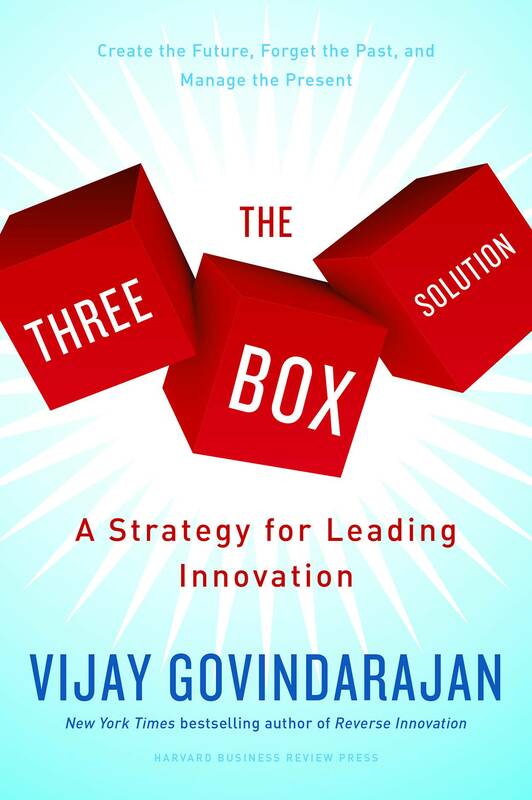 In his latest book, “The Three Box Solution,” he distills his research and teaching into an easy-to-understand, three-box framework representing the present, the past, and the future. With this book, and as the first holder of the Coxe Distinguished Professorship in Management, a new Dartmouth-wide faculty chair, VG is teaching that for business leaders in their organizations—and for everyone in their daily lives—it’s all about balance. If you could distill the primary theme of this book into one lesson, what would it be? I think the most important lesson of the book is to realize that the future is now. The future is not about what you have to do in the future: it’s about what you have to do now to create the future. This is simple to understand but a hard lesson to practice. The book is about how to balance today and tomorrow every day. Could you describe the three-box framework from your book? The three boxes represent the present, the past, and the future: in box 1, you manage the present; in box 2, you selectively forget the past; and in box 3, you create the future. A CEO has to make a deliberate, purposeful effort to achieve a balance among all three boxes—a balance of energy, time, and resources. The problem isn’t that CEOs lack focus on box 1; the problem is that they lack focus on boxes 2 and 3. To what extent is the CEO, the person with the vision, of paramount importance in creating a structure so that everyone in the company understands that vision? They have a very important role in maintaining the three-box balance and in emphasizing to people why each box is important. But they alone cannot do it. Everyone in the organization has a role. It’s important for people to realize why they are all important and why they are interdependent parts of a whole. And I think once that clarity comes, everybody is excited. Nobody wants to be part of a declining empire. How does a leader ensure that people who are employed as part of the different boxes all feel valued equally? It is the job of the CEO to keep emphasizing that box 1 is not a dinosaur, that it is the foundation. The present is the performance engine, so it is critical to keep box 1 healthy. And it is the CEO’s job to emphasize that box 3 is the future, the unknown, and to ensure that box 3 people aren’t frustrated when they fail along the way. Failure is OK, as long as you’re building knowledge and adjusting your course. It is the CEO’s job to make the organization realize failures are not mistakes. Both boxes are important: today is important, tomorrow is important. Is it fair to say that when a leader is working in box 3, it’s really a matter of casting a wide net when thinking of the future? Exactly. In fact the experimental testing I discuss as part of box 3 is a way to cast the net very widely. That is the fundamental difference between box 1 and box 3. Box 1 is very much about variance reduction, while box 3 is very much about variance expansion. In box 1, you give the manager a business plan and say, “Vary as little as possible from this plan.” You have to hit the revenue number, the cost number, and the profit number. In box 3, it is about casting the net very wide. You want to open up as many different paths as possible because you don’t know yet what the right path is. So you place a lot of bets—small bets, low-cost, low-risk experiments—in different areas. So you expand the variance, and at some stage you will understand what the right path is. Then you can galvanize behind it. And if an experiment fails, you go in a different direction—you pivot. The important point is that in box 3 you place smaller bets before placing bigger bets. How does three-box thinking apply to teaching at Tuck? I would say that much of what we teach in the MBA program is in box 1. Because box 1 is where we can apply our analytical tools, our techniques; we can apply optimization and decision science. Box 1 is a known system. Box 3 is an unknown system. In my Implementing Strategy course, I try to emphasize the three-box balance as a very important leadership attribute. And that students use it in their very first job and in their own personal lives, to drive their own personal strategy. Would you say there has to be a certain amount of confidence in taking the experimental steps you describe, in understanding that it’s part of a process, so that you don’t fear the future or change? Yes. When I meet with companies, I tell them there are three important things they should do. One is to pay attention to weak signals. In box 1 you respond to clear signals; in box 3 you’re responding to weak signals. You must spend time understanding the weak signals, and there are lots of them. The nature of weak signals is that they could be noise or they could be a real signal. That’s why they’re called weak. Second, you develop hypotheses about the future, based on the weak signals. And third, you conduct those low-cost, low-risk experiments to test these hypotheses. These three can be done in a disciplined way so that you are not afraid because you are moving with sufficient knowledge. You’re making a small step, understanding what that is, and taking another small step. Finally, how do you select what in box 2 will be discarded? That must be very difficult. You have to understand, based on weak signals, how your industry will change in the future. The exercise has to start with imagining the future and then deciding whether things you are doing today are relevant and discarding those that aren’t. In a way, that’s the mark of leadership. Leaders are able to paint a picture of the future and take the organization there. John F. Kennedy is a great example. In 1962 he said, “We’ll put a man on the moon and bring him back before the end of this decade.” That was his box 3 vision. At that time he didn’t know all the steps to take. But in box 3 you experiment, test, learn, adjust, and then you get to your box 3 future. And what he was saying then was, Let’s remake America, let’s reinvent technology in the U.S., let’s reinvent education in the U.S. This is really about reinventing ourselves. That gets people pumped up.